Flash photography doesn’t make this dish look that appealing…but really, it tastes delicious! 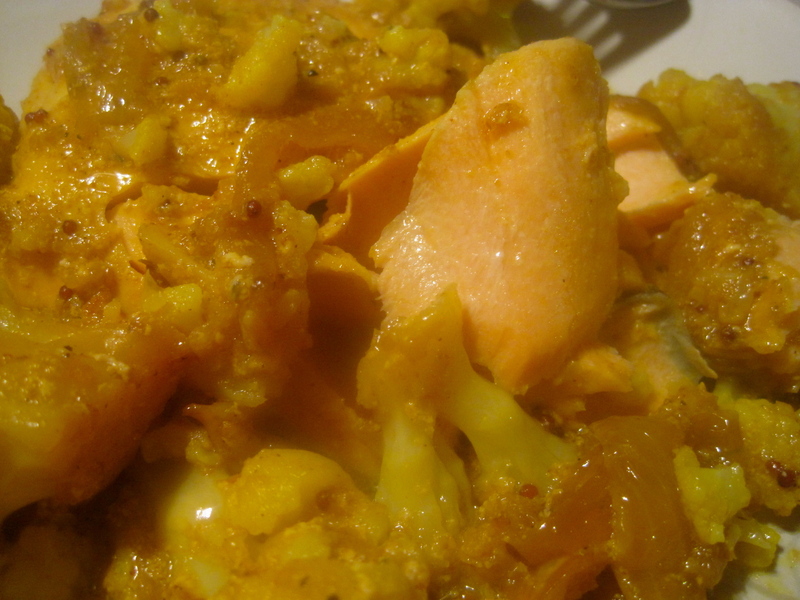 This salmon and cauliflower curry is one of my favorites. It became a mainstay one summer solstice. I always like to prepare yellow and orange foods on the solstice, to celebrate our life-giving Sun. I wanted to make a bright yellow curry, with a thick sauce that would cling to the vegetables and salmon. What I came up with is not only delicious, but full of healing ingredients. Cauliflower and turmeric fight prostate cancer and turmeric blocks the development of melanomas. Given that my husband’s family has a history both, I’m especially glad this dish has become one of our favorites. Turmeric has many other health benefits and worth including in your diet. Since it is fat-soluble, always include some fat with the meal to increase absorption. Salmon, of course, has many health benefits, especially its omega-3 fatty acids. Add some yogurt with live probiotics and cilantro with its many health-promoting properties, and you have yourself a dish chock full of awesome nutrition. Melt the ghee in a wide, flat bottom saute pan over medium-high heat. I start with 2 tablespoons, then add more as needed. Add the mustard seeds and curry powder the pan and cook for a moment, allowing the curry to dissolved into the ghee. Add the onion and cauliflower, tossing gently to coat with the ghee. Cook for 10-15 minutes, leaving the vegetables to sit for several minutes at a time so they can brown while carefully monitoring the heat so they do not burn. Melt more ghee in the pan, then add the garlic and ginger and cook for a minute. The garlic and ginger will stick to the pan. Add a half cup of water to the pan, let it cook off briefly, then deglaze the pan, scraping off the cooked on bits. I find that a bamboo stir fry spatula deglazes well without scratching the pan. Mix 1/2 teaspoon curry and 1/2 teaspoon salt, then rub into salmon fillets. Place the fillets skin-side down on top of the vegetables. Add another half cup of water, then cover the pan. Cook for 7-10 minutes, until the fillets are cooked through. Remove the fillets to a warm serving dish, turn the heat to low, deglaze the pan with another half cup of water if necessary, then add yogurt, cilantro, salt and pepper to the pan, stirring gently to make a thick sauce. Serve immediately with the fish. This post is part of The Liberated Kitchen’s GAPS Friendly Friday. I am a personal chef and cooking instructor with a deep and personal interest in healing with whole foods. I started Lost Arts Kitchen so I could share what I have learned about preparing real food on a real budget while living a real life.